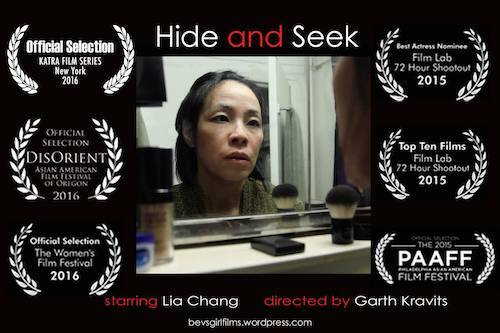 Lia Chang and Garth Kravits’ Hide and Seek is an official selection of the 2016 Katra Film Series May Edition, and will screen on Saturday, May 14, 2016, along with a selection of shorts in honor of Asian-American Heritage month; powerful documentaries shot in Liberia and Cuba and a program of edgy NYC-based films. (All tickets include Screenings, Q&A, after party). Click here for tickets and more information. Screenings, Q & A and after party: 6:00 p.m. – 10:30 p.m.
Tracing the journey of the late Japanese cinematographer Ryo Murakami to the Firestone Tire and Rubber Plantation in Liberia. Under the cover of night, Ryo trespasses onto the plantation grounds and enters a scarcely seen world. Carlos is a young Cuban filmmaker facing censorship for the first time. He must choose between taking a great career opportunity or maintaining the integrity of “Yunaisy”. A haunting experimental, docu-musical about global warming and changing the dream. A woman is guided by a dream therapist onto a shamanic journey through the inner and outer worlds of being. Ken Chang is ready for the American dream. The only trouble is that he’s just too American. In order to land a role on a network TV Show, Ken is forced to undergo Actor “Orientalification” to prove that he can be Asian enough to make it in Hollywood. A short film that speaks to the societal challenge that women, and especially women of color, endure every day. Lessons in loyalty and deception between drug dealers and cops are learned the hard way in the city’s underworld. Do you have a short film, web series, short doc, music video you’d like to submit? Katra is looking for short content of any genre/form no longer than 45 minutes in length. From NO BUDGET to BIG BUDGET. Visual art, experimental, animations are welcome! Submit via Film Freeway.